The WordPress for iOS is an app for iPhone, iPod touch and iPad which allows bloggers to compose, write, edit, manage blog posts, pages and comments with location mapping and geotagging support directly from the iDevices without having to launch a web browser. WordPress for iOS is optimized to make blogging easier on the iPhone platform. 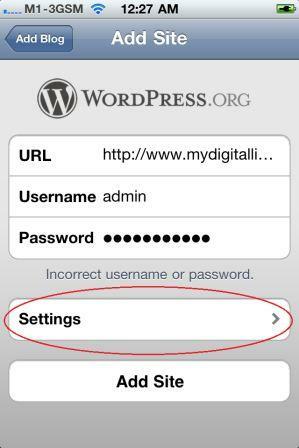 However, on latest version of WordPress for iOS 2.6.2 and some other versions, some users may encounter a problem where the app prompts “Communications Error” or “Incorrect user name or password” error when attempting to add or open a self-hosted WordPress blog, despite users have double-confirmed and made sure that the user name and password entered is correct and valid. The first step to fix or resolve the incorrect username or password issue in WordPress for iOS app is to ensure that XML-RPC remote publishing protocol is enabled. To check and enable the setting, go to Settings -> Writing in WP administration backend, and then select (tick) the check box for XML-RPC under “Remote Publishing” section to enable the WordPress, Movable Type, MetaWeblog and Blogger XML-RPC publishing protocols. When adding a WordPress blog, click on Settings. Remove any text that inserted into Username and Password fields of “HTTP” section, so that only HTTP Auth Username and HTTP Auth Password are appeared. On “Add Site” or “Edit Site” screen, re-enter the password for the app to authenticate and validate the user name and password again, and returns a “good to go” message. 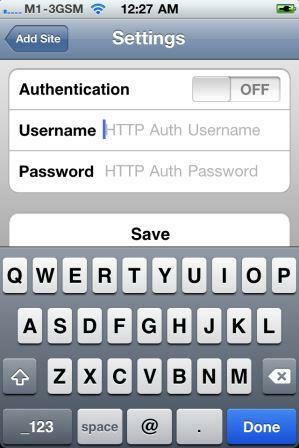 Add the site once user name and password is validated.